Immerse yourself in a different culture, share your skills and be inspired by the amazing people of India. This extraordinary country has incredible diversity, from the towering silence of snowbound peaks to the lap of waves on coral shores, via the cacophony of noisy, frantic cities. New wealth but also staggering poverty, both in the cities and in the countryside, where we offer gap year projects and volunteering opportunities in the Darjeeling hills of India and the foothills of the Himalayas. Our volunteering program in India is based in the rural Lepcha communities helping to support the Indigenous Lepcha Association in their efforts to retain their ancient culture. Living in a Lepcha village at around 1500 – 2000m, your volunteer project will include helping with subsistence farming on tiny terraced fields of rice, ginger and spices. You will teach English in the village culture centre and in tiny local schools for three months, living with a Lepcha family for true cultural immersion. 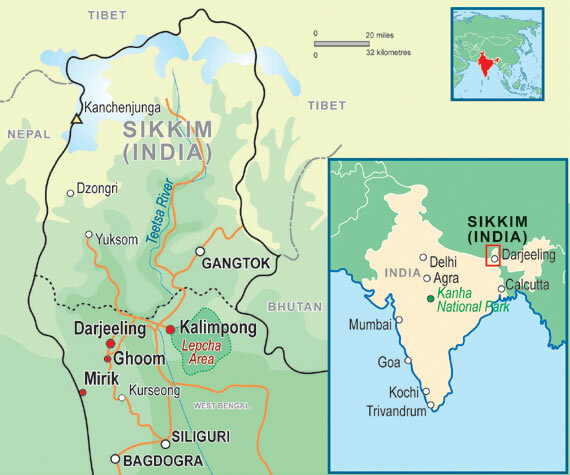 Both the Lepcha villages and the Darjeeling District areas are cooler than most of India because they are higher. This means that it is quite cold in January/February, but starts warming around late February. The very best weather is in October to December. The January group gets the best festivals! Travelling in the main part of India can get hot in May to June (up to 48° C!) and wet during the monsoon (late June to September). Lepchas: Diwali (Festival of Lights) is moveable but usually in October/November. There are many Lepcha festivals in the spring and Holi (festival of colour) is in February/March. Wear old clothes as the main fun is throwing coloured powder at each other! India is not expensive unless you fly a lot or stay in smart hotels. Backpackers can live quite well for less than £20 a day and travel by train is cheap. There are ATMs in most towns now – certainly in Kalimpong. You should have VISA credit or debit cards. Mastercard works in a few places but the system does not recognise Switch, etc.